Now, as you all know… AVEDA IS AWESOME!!!!!! We have a lot of cool holiday things going on from our upcoming Open House in December to our FABULOUS new gift sets for very affordable prices. You can buy two of our AMAZING holiday gift sets and get the chance to spin the wheel for a FREE prize.. and YES, you are guaranteed to win something! With the purchase of a $100 gift card, we will also give you a free $25 gift card to show our appreciation. So, come out and visit us at Aveda and I PROMISE you will NOT be disappointed! Its a great day at Aveda this holiday season! Why is that you ask? This year Aveda would like to make you and your family’s Christmas a little special with our new holiday gift sets! With assorted products ranging from travel and tall sized hair products, moisturizers, bath salts and candles with naturally beautiful gift wrapping. For a limited time only we also offering a spectacular deal when purchasing gift sets. First off for pure privilege members after purchasing one gift set you are awarded an extra 150 points, two gift sets 300 and a whooping 700 extra points if you buy three! now it doesn’t end there! If you are to purchase 2 or more gift sets you are guaranteed a prize with our prize wheel! Stop by Aveda today and let us treat you to a great day at Aveda. The holiday season at Aveda is going to be an experience for me because we have several events going on, plus it is one of the busiest time of the year. 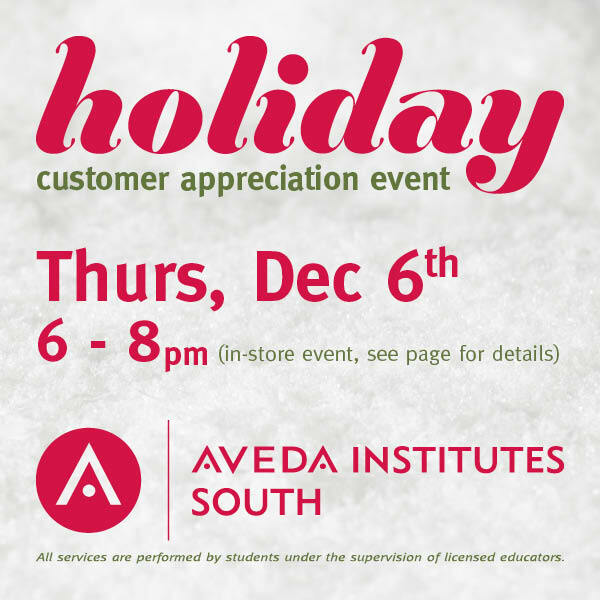 Aveda has its Open House this year on December 6th. This will be my second open house and I am just excited this time like I was the last time. I love seeing all of the current returning Aveda guests coming to try out some of the new products, get their makeup done and get a mini-facials from Spa Clinic and Spa Intro. Plus, Aveda has gift sets and I would recommend these gift sets because there are different varieties and everyone will enjoy them. My personal favorite is the Hand Relief mini pack with the two different aromas that they come in and I also like the Rosemary Mint gift set as well.